The experience began with a dinner in mid October 2017. I had read the problem question on the train in and was desperately trying to look like I knew what I was doing. In the weeks following, work began on the first part of the competition: written submissions. It became apparent quite quickly that the workload was immense, and that the team was in for a long summer. The process of drafting written submissions for the Claimant, and subsequently for the Respondent involved in-depth research spanning both the Common law and Civil law paradigms. It involved jettisoning some of our Common law penchants for ignoring parol evidence. It involved relying on the opinions of scholars in the same vein as we do cases. It involved spending more late-night hours in the law school boardroom than I care to mention. It involved some questionable fast-food decisions from certain members of the team. And then the 'hard part' was over. We then endeavoured to convert the fruits of our labour - 70 pages of written submissions - into oral submissions. As a team we participated in pre-moots (privately organised mini-competitions for Vis prep) against one another and against other teams from Australia. Then came the big trip, we participated in pre-moots in London, Paris, Belgrade and The Hague - with the actual competition taking place in Vienna. We quickly realised that some arbitrators will like you and some will not. Some will ask questions and ultimately speak for longer than you do and others will silently ponder the meaning of life. Along the way we faced fierce competition against the likes of Columbia University NY and the Honourable Society of Middle Temple, and made many friends from Switzerland, the US, Germany, the UK, South America and elsewhere. We enjoyed our free time by visiting land marks, eating the food, going to the parties and of course, sinking some drinks. 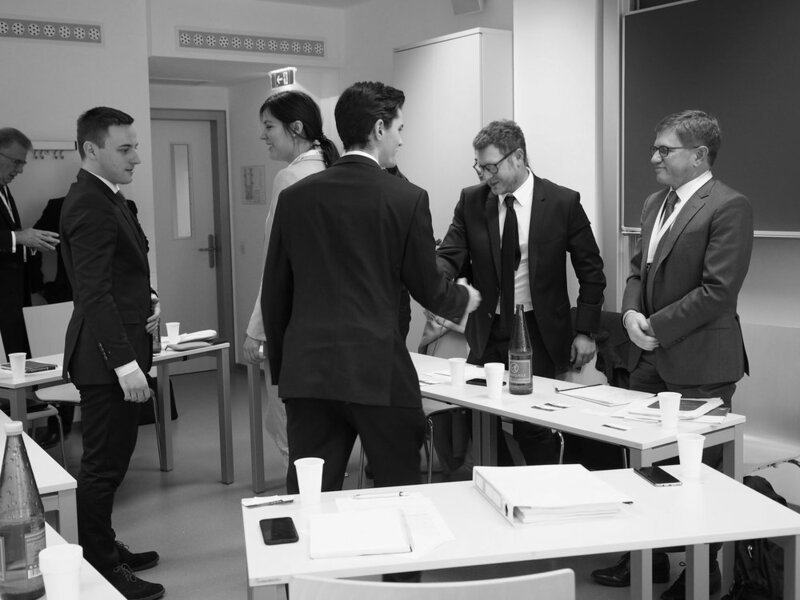 The Vis moot is both an opportunity and a challenge. By the time we arrived in Vienna, the pre-moots had proven their worth as we were infinitely better pleaders than we were when we left Australia. The opening ceremony demonstrated the sheer scale of the event. Competitors filled the 2000 capacity Weiner Konzerthaus to the point that there were not enough seats. There were over 800 total hearings in Vienna. The team had four general rounds of mooting and the team performed valiantly. Unfortunately when the 360 plus teams were culled into a group of 64, we were knocked out. Whilst it was not the result we wanted, upon reflection it does not detract from the experience one iota. Accordingly, we commiserated with the other teams over drinks at Aux Gazelles (a dedicated club for Vis competitors). I recall in perhaps the fifth week of my very first semester at Notre Dame, Frank regaled the Legal Research and Writing class with tales from Vienna. I never pictured myself as being the type to participate in something like the Vis moot - perhaps because he mentioned that the problem question was some fifty pages in length. However, having now braved the gauntlet of written submissions and felt the exhilaration of making oral submissions, I cannot recommend it highly enough. I must thank my teammates Esther, Maddie and Lucy for an amazing experience and for accepting my disdain for Thai food. To our coach Rebecca who travelled with us, sacrificed her phone, supported us and helped us improve exponentially. To Gemma and Svetlana German for providing us with unwavering support and assistance (often more than we deserved). To Keith Thompson and Frank Esparraga who cheered us on in Vienna. To the NDSLS for the robust support and sponsorship. And to the Law School for facilitating our involvement in the moot. The Vis moot is both an opportunity and a challenge. An opportunity to see Europe from a unique perspective and to connect with like-minded individuals from across the globe. It is a personal challenge to put into practice everything you have learned at Notre Dame and to prove to yourself that you are just as capable as any other law student in the world.